DO NOT USE HORNADY SUPERFORMANCE 30-06 165 SST, LOT #3101052. The lot number can be found printed on the underside of the box label. If you own this lot number or have any questions regarding this recall, please call 800-338-1242. 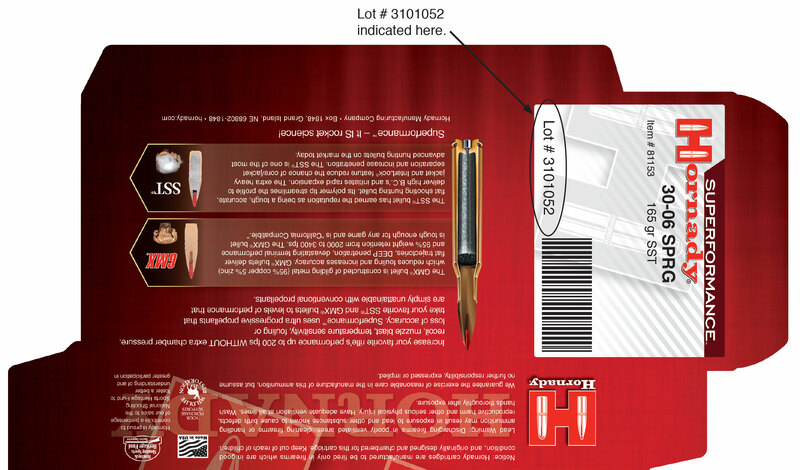 Hornady Manufacturing Company will make all arrangements associated with this return and replacement of the product. ANY OTHER LOT NUMBERS OR ITEM NUMBERS ARE NOT SUBJECT TO THIS RECALL AND REQUIRE NO ACTION. Thank you for your attention. We apologize for this inconvenience.